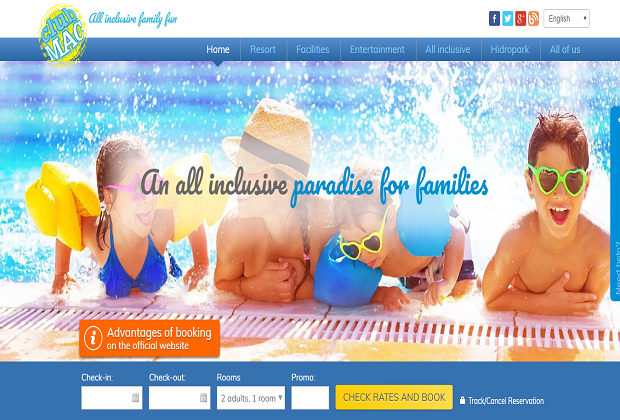 We like to make life easy for our visitors at Club Mac Alcudia, and we’ve designed our website and apps to reflect this. You can find everything you could possibly need to know about visiting Club MAC Alcudia on our website, including information about entertainment programmes, shopping, the beach, swimming pools, food and much more. Click on our home page and you’re at the heart of the information about the resort. You can find out all about the layout of the resort, along with links off to activities, restaurants, children’s activities, the Hidropark situated opposite the resort and much more. Check out the welcome video on the home page for a real insight into the resort before you book. It takes you on an exhilarating guided tour around Club MAC hotels, so you can get a real flavour of what it’s like to holiday with us. The host shows you around the swimming pools and explains the themed food nights at Club MAC. There’s also a visit to the Hidropark, which is open to all Club MAC residents for free. From the home page you can also download the Club MAC app, which is available for Android and Apple. Our resort page has all of the technical information about the resort. You’ll find resort maps, bus timetables and information on rooms, facilities and services in this section of the website. There’s also background information on the resort layout, and on the bedrooms available to help you make the best choice for your perfect family holiday. The facilities pages show a clear map of the resort, showing you the location of the three main buildings, swimming pools, lakeside areas and more. This section also links out to the extensive programme of entertainment, activities and shows that you can enjoy at Club MAC. We have separate, specially designed entertainment and activity packages for different age groups, ranging from the smallest to the adults in your party. We can guarantee no one in the family will have time to be bored while they’re staying at Club MAC! On the facilities page, you can also find out about the extras you can hire to make your stay comfortable – they’re listed on the site with instructions on how you hire when you arrive. We think we’ve covered everything but if there’s anything you need when you arrive, and you’re not sure how to get hold of it, just ask at reception and we’ll do our best to help. While you’re at Club MAC, you can eat at any of the restaurants during opening times, as long as you’re displaying your wristband. We have plenty of different kinds of food on site, and you can check out the details in this section of the website to find out where you can get food and drink during your stay. There are also drinks stations on the landings in the main accommodation buildings, from which you can help yourself to tea, coffee, water and juices 24 hours a day. In this section of the website you can find out all about our health & safety rules and regulations, along with links to our blog and company information. As well as the information you need to find out about Club MAC, you can book online directly with us. This is easily the best way to book a holiday with us, as it guarantees you the best possible price. When you book online, you only have to pay a 10% deposit, and then pay the rest when you arrive at the resort. You can also cancel your booking free of charge up to midnight on the day before you’re due to arrive. We’ll price match any cheaper version of the same package you find on another website, even after you’ve booked with us. We look forward to booking you in!